Mark’s Expert Auto Service, Inc. "Experience Not Experiments"
Mark’s Expert Auto Service, Inc.
At Mark's Expert Auto Service, Inc. we are striving for perfection in customer service and auto care. Mark's has been serving the Burien, Normandy Park, Boulevard Park, SeaTac, DesMoines, and West Seattle areas for over 27 years. We enjoy a high rate of customer satisfaction as evidenced by positive internet reviews. We're committed to making your auto maintenance and repair experience as comfortable as possible. We make sure our customers are informed with the necessary information during their visit. Our shop uses many resources including long standing experience, modern test and repair equipment such as the complete diagnostic system from Automotive Test Solutions, the unique iATN network and database information, Mitchell On-Demand and other creative forms to come to a solution to your automotive needs on today's complex computerized automobiles. In cases where a vehicle is in for service or preventative maintenance, we apply old fashioned values of determination and the best available parts, sourced by quality before cost, and thorough installation of these parts to ensure the highest customer satisfaction. 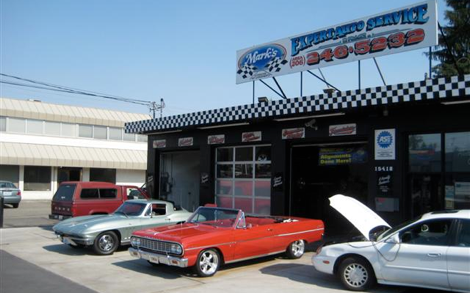 Mark’s is your ONE STOP experienced, honest auto repair and maintenance destination. Come see us– we will take care of you. Preventative Maintenance-also 30,60, 90 K factory services. Quality parts used in repairs. Diagnosis before parts replacement-we test, not guess... saves you time and money. Local, family business committed to your satisfaction. Mark’s Expert Auto Service Inc.